More evidence of the "Incompetence Syndrome"; Struck With Blindness! Our leaders are being manipulated by the powers of this dark world and against the spiritual forces of evil, as Kim Jong Un released yet another missile which reached an altitude of 770 km and flew 3700 km, meaning that Guam is easily a target from the DPRK. What can South Korea, Japan, and the US do apart from eventually retaliate against the rogue party? An invasion is not an option as is a covert operation, the dark powers of this world and the spiritual forces of evil are hell bent on dragging this world into a nuclear war with DPRK China, Russia, and their allies, facing up against South Korea, Japan, US and their allies. South Korean President Moon Jae-in says dialogue with North Korea now “impossible. ”Tillerson calls for Russia and China to take “direct action” against North Korea South Korea has the power to make DPRK "break into shatters", says President. North Korea launched a missile east towards the Sea of Japan (East Sea), South Korea’s Joint Chiefs of Staff (JCS) said in an alert early Friday morning. 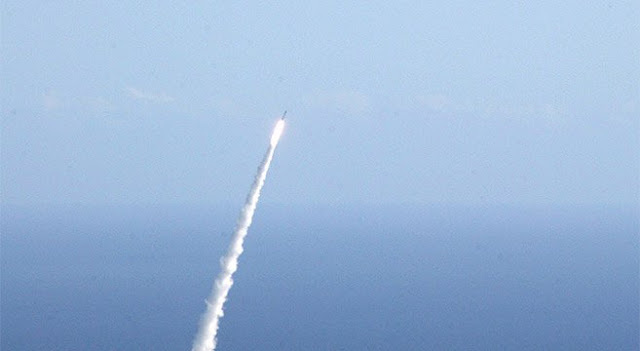 The JCS released an early assessment stating that the missile reached an altitude of 770 km and flew 3700 km, meaning that Guam – about 3,400km from Pyongyang – would be well within range if the missile were launched south-easterly. Japan issued an emergency alert at 0706 am that the missile flew over Hokkaido, Tokyo broadcaster NHK said. The broadcaster then reported it splashed down in the Pacific Ocean some 2000 km east of the northern island of Hokkaido. The missile was launched from near Pyongyang’s Sunan International Airport, the JCS said, the same location used for an intermediate range ballistic missile (IRBM) launch on August 29. Initial performance indicators from the missile launch, however, suggest it may have been a Hwasong-12 intermediate range ballistic missile. The missile’s single-stage transportable liquid propellant system notably serves as the basis for North Korea’s Hwasong-14 intercontinental ballistic missile. United States Pacific Command (PACOM) reported that its initial assessment had determined the launch was of an intermediate range ballistic missile (IRBM). The United Nations Security Council (UNSC), according to Reuters, will meet at 3 pm EST, Friday, to discuss the launch.